A series of airline billboards advertising flights from San Jose to Vietnam has caused an uproar in the community, with some saying it glorified a communist leader. San Jose City Council members Lan Diep and Tam Nguyen are both receiving backlash from Vietnamese community over the billboard. The council members are accused of being community sympathizers even though they were not connected to the billboard ad. 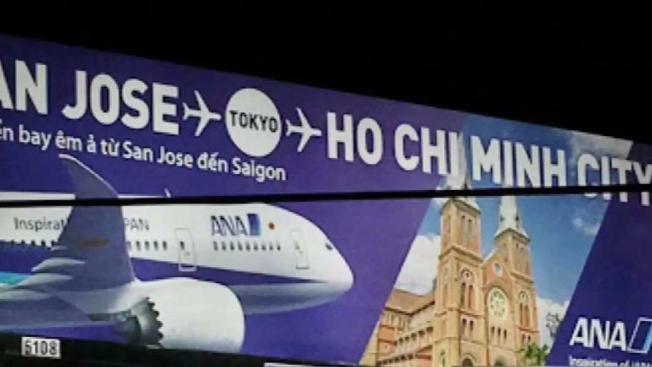 The billboard in question promotes a flight on All-Nippon Airways from San Jose to Ho Chi Minh City, which most Vietnamese refugees and non-communist communities prefer to refer to as Saigon -- the city's name before the Vietnam War. Customers at Cafe Paradise on Monterey Road, a popular cafe that sat under the billboard, were the first to complain. Nguyen said he even got angry calls referring to him as a communist even though he had nothing to do with the ad. "Well actually as soon as I noticed the billboard, my reaction was 'that's not right,'" Nguyen said. "The idea of anything related to the communitsts would not be only offensive, but a total blow to the community, including using the flag." Diep praised ANA airlines for taking down the billboards quickly. "What's important for the community is to not have this constant reminder in our face about Ho Chi Minh, and to not normalize it for our non-Vietnamese friends and other neighbors," Deip said.